The life and legacy of Florence Nightingale has been celebrated in a special service at London's Westminster Abbey. A symbolic lamp was borne through the abbey by Florence Nightingale Foundation scholar Sandra Monoga, pictured, flanked by nursing and midwifery students from Edinburgh Napier University. The lamp was then passed to Florence Nightingale Foundation scholar Gerry Bolger, and on to fellow scholar Sarah Noble. This represents the transmission of knowledge from one nurse to another. 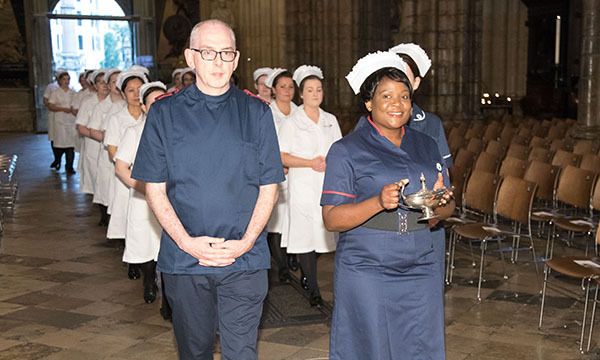 The service on 17 May was conducted by the Dean of Westminster, the Very Reverend John Hall, who said: ‘We pray that Florence Nightingale’s ideals of compassion, quality of care, and training may continue to inspire and sustain nurses everywhere. She joins other celebrities who have dressed up as their rebel heroes.